Moondance Heavenly Desserts is an Ohio bakery that recently began offering its cheesecakes and brownies at Whole Foods markets in the Philadelphia area. Founder Shelley Ritchie, who started the company in 2005, has created a number of desserts that are made in a dedicated gluten-free bakery. In addition to six different cheesecakes, Moondance offers fudge and walnut brownies. Shelley was kind enough to send us some desserts to sample. Both the mini cheesecakes - baked on a pecan shortbread crust - and the brownies are individually wrapped. We tried the raspberry ribbon cheesecake, which will be featured at Whole Foods for Mothers' Day, along with the classic and butter toffee varieties. 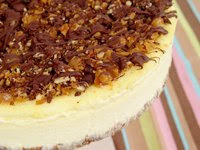 While all of the cheesecakes were deliciously creamy, the entire family felt the standout was the butter toffee (above), which is topped with crunchy pecan and toffee pieces. We also enjoyed the brownies, which were rich and moist. Other cheesecake flavors include chocolate chip, lemon curd, and pumpkin, which is sold seasonally from October to December. In addition to the mini size (4 oz. ), Moondance's cheesecakes are sold in a 6-inch version that serves eight people. The brownies (4 oz. for the fudge variety, 5 oz. for walnut) are priced at $3.99 each, the mini cheesecakes at $3.99 each, and the larger cheesecakes at $17.99 each at Whole Foods. The mini cheesecakes also are available for online ordering through the Gluten-Free Mall.